While waiting for the package of Orky goodness to arrive (shipping from poland takes ages), I have been dabbling with the next heresy-era project where I'm going back to my first 30k love, the Thousand Sons! The plan is to do a primary detachment of Sons, and an allied Imperial Army detachment where I'm going to be kitbashing up some Prosperine Spireguard. ...And while waiting for the packages of bits for them to show up, I dove in on what will be the centerpiece of the Spireguard force, a Malcador Assault Tank! Just laying on the base colors thus far, still a long way to go. Going with the usual recipe of red, bone and gold - really enjoyed being able to play with some colors after doing the Iron Hands! I went for the Malcador mostly because I've never tried my hand at one before, and to be honest in 40k the tank is somewhat lacklustre. However, in the 30k era, the munitorum and mechanicus were up to the task of keeping it maintained, which means that it is a Fast superheavy. 12" a turn, and can fire everything as though it was stationary (at different targets, to boot). What's not to like? 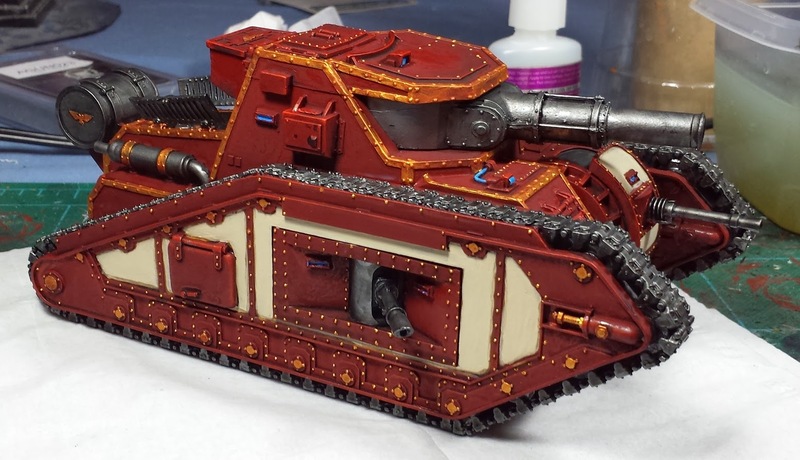 Having had a chance to work on this one, I'm definitely interested in pickup up a Valdor at some point in the future! I've banged out a couple test models for the Spireguard as well, pics to follow soon! ohhh! So much colour. I love it. I have always loved the look of that tank but with those colours is it amazing! Yep, Perfect for 30k. The effort you went to on the individual rivets was worth it. A sterling job all round! That is an amazing looking tank, sir! I agree, the rivet work really makes that thing pop. But...But...But...you SOLD your 30K Sons from before, didn't you? And now you're starting again? Or am I thinking of something else? I've still to paint my Malcador Defender, but when I do, I hope it'll be as pretty as this one. @Col. Ackland: Thanks! 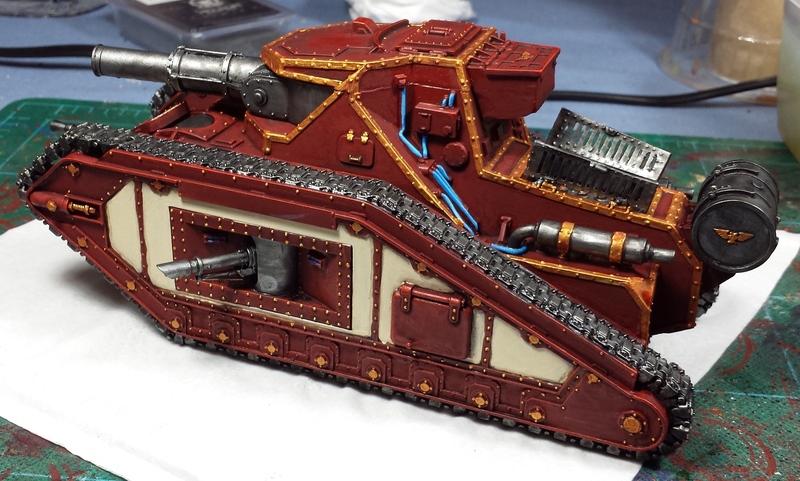 I'm pretty pleased with it so far - lots of detail and weathering still to come! @Colonel Scipio: Cheers! I'm sure I'm gonna regret the decision when I'm painting my 30,000th rivet later on in the army. Hah! @Green Stuff Industries: I appreciate it! I think the extra effort will be rewarded. @Miniature Tim: Indeed I did. I suffered a serious case of "seller's remorse" though, so it's time to give the Sons of Magnus another go. The earlier army was set in the Great Crusade era and as such was pretty vanilla. These guys will be set during the burning of Prospero, so will be a bit more chaos-y, I think. @Dai: Nice! I really dig the Defender (the ring of heavy bolters in the 'turret' are really cool), looking forward to seeing what you do with yours! That's a Nice Tank! The gold trim really makes it pop.